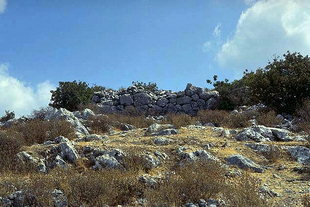 The acropolis of the ancient city is above the village, near the cemetery church of Agios Ioannis. Excavations have revealed a large temple platform, possibly of Aphrodite, a statue of Dimitra and several other finds including the excellent bronze helmet displayed in the Iraklion Museum (Room 18). In Axos, Zeus and Apollon were also believed to be worshipped.